I'M COMING IN UNDER/over THE WIRE (12:13 a.m.) CST)!! last Saturday while we sewed together. She wanted to participate in the Blog Hop too!! I think they're awesome! She cut, measured, sewed on the sewing machine and stuffed ALL on her own! Pincushion...turned over so you can see the piecing she did. Thanks Madame Samm & Kristen for Cheering us on!! Love your variety of pin cushions! Your Grand daughter did a marvelous job on hers. Thank you for sharing. They are all lovely - especially your grandaughter's another sewer/quilter in the making! Nice collection for sure. Thanks for sharing. I love your pincushions! The cathedral window pincushions look so intricate! I did a workshop on cathedral windows once....never did them again! I might try these though..... Your granddaughter did amazingly well! How great to sew together! Well done. What a lovely collection of pincushions and sweet to be able to share your creative space with your granddaughter. Your granddaughter did a great job. Sorry, love the pincushions from your granddaughter the most. What a great display of such pretty pincushions! And your granddaughter is well on her way to being a quilter! WOWEE!! Fabulous showing of pincushions by you and your granddaughter. Makes me miss Allie!! What a great collection of pincushions! Just delightful! I've seen these Cathedral Window Pincushions around, but missed the post on Moda Bake shop. Thanks for the link. Your grandaughter is a budding quilter!! She did a great job! I LOVE the Cathedral Window pincushions! Your granddaughter did an awesome job on her pincushions too. Those Cathedral Windows are so nice! I'll have to make one some day. Really nice pincushions! I love the ones your granddaughter made. Sewing with a child is so much fun. Oh, these are all wonderful...great work! Love the Cathedral Windows especially. Your pin cushions are very lovely ! Oh Grandmama, you've done it again! Nice pincushions. I like that sugar bowl one. Wow, you made all of those pin cushions, baby sat, and made it on time to the party? Amazing job. Thanks for sharing. What a lot of pincushions, and they're great too. Those are gorgeous cathedral window pincushions...love the fabrics in them! Love the other ones, too. Sweet, sweet pincushions by your granddaughter. Too cute! They are all beautiful! Since I am partial to 'sugar', that is my favorite! How did you attach it to the sugar bowl? Amazing pin cushions--I love the sugar bowl. Your granddaughter did a lovely job, also. I love to sew with my granddaughters,too. I bet you are so proud of her. These as soooo cute. I love all the pincushions but especially the ones made by your granddaughter. It is lovely that she shares your hobby. What a great show of pin cushions! Compliments to your granddaughter, that are two cute pin cushions she made! Thanks for sharing. Thanks for sharing your lovely pincushions. Its great that your grand daughter is learning to sew. Very nice, I love the cathedral ones. Ah so sweet, your granddaughter is doing really well with her sewing, I keep trying to get Jonah to sew with me but he isn't biting . Your pin cushions are sooo cute, rock the baby with one hand sew with the other,lol. Lots of cute pinnies. And tell your grand daughter she made some great ones too! I can't wait till mine is old enough to sew with me (she is only 2 1/2)! Great display of pincushions and your granddaughter did a fantastic job as well , thanks for sharing ! How very nice that you are teaching your granddaughter to sew. That's what we're supposed to do, right? Thanks for sharing your creativity today. What a wonderful bunch of pin cushions! Wow! Each and every one is wonderful! Tell your granddaughter that she did a GREAT job on her pin cushions! I love them! So many wonderful pincushions. I must say I love your "sugar bowl find" and how it turned out. The grand daughter did a great job too. She has a great teacher. All your pin cushions are so pretty. I especially likes the Cathedral Window ones. Thank you for the tutorial, I am going to try to make one. Great pincushions by the whole family. Congratulations grand daughter on your first blog hop! Well done! These are all so cute. I love making those Cathedral Windows ones, too. Your granddaughter dis an awesome job, too! Your pincushions are so pretty! I love the antique sugar bowl one. And how precious is it that you are teaching your granddaughter to sew, and getting her started as a blog hopper already! I just made my first Cathedral Window and I loved it! I love all of yours. And your granddaughter did a great job! I love her pincushions too! They are lovely - I love the chevron red one. Thanks for sharing and sorry I am late visiting. That is quite a collection! Your grand-daughter's did a great job on her work. I am glad she participated too! I love your cathedral window pin cushions. I will have to make at least one. Your Lost Treasure pin cushion is very elegant. Great repurposing. Thanks for sharing. Great that tour granddaughter already is sewing, love the cathedral windows. I had great plans to make a Cathedral window quilt a few years back... yup every one got an ornament. Didn't think of a pincushion! 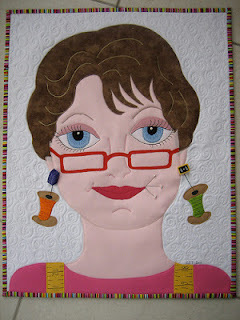 Hooray for having a granddaughter that wants to sew with grandmama. Those cathedral window pincushions would probably be the only way I would manage to get one of those made but I must say yours are lovely especially the one with the vintage family button. THX for sharing with us in bloggerland. Those grandkids keep us busy, that's for sure. I think you did a spectacular job getting so many made for the hop. I really love ones like your sugar bowl - what a perfect way to use a sug bowl that's lost/broken it's lid. Congrats to your granddaughter for her sweet pincushions. Hooray! A very nice collection. All are lovely and a great sewing experience with granddaughter. Thanks for sharing. Wow, love those cathedral windows cushions. The vintage modern one is just beautiful! Hi!!! They are all very pretty!!! I love the owl!!! Wonderful to have a gran daughter making them with you!!! Sew sweet!!!! Such pretty pincushions. Tell your granddaughter that her pincushions are darling...good for her!